Bates Family Blog: Bates Updates and Pictures | Gil and Kelly | 19 Kids | Bringing Up Bates | UP TV: An Engagement and A Courtship? Before too long, Gil and Kelly Bates could be giving away three more daughters in marriage! Tori Bates, Carlin Bates, and Josie Bates are all in serious, marriage-minded relationships. In fact, they gathered their guys for a triple date in Downtown Knoxville this weekend. The last official word was that Tori and Bobby were courting, Carlin and Evan were boyfriend and girlfriend, and Josie and Kelton were "special friends," but stay tuned for some exciting announcements! 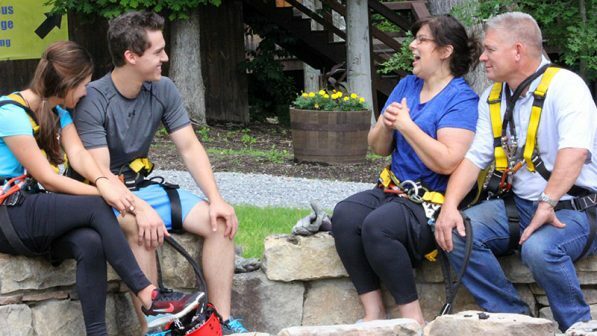 Looking ahead to next Thursday's episode of Bringing Up Bates, Evan and Carlin will sit down with Gil and Kelly for a "large talk" to discuss entering an official courtship. Tori and Bobby have said many times that their original plan was to tie the knot next May but that they could see themselves moving that day even closer. Also on next week's episode, Bobby will ask Gil a very important question. Josie has just started her final semester of cosmetology school, and Kelton is already a college graduate. If you had to guess, when do you think each of these Bates weddings will be? Tori and will get engaged in the next few months and will get married either in may or early next year, but will stay in the area until tori graduates. Carlin and Evan will start a courtship by the end of the year if not in the next few months and will get married or at least engaged by the end of next year. anon @ 4:56 - great guesses! isnt't wonderful to see the 'middle' kids in relationships now! I think Tori and Bobby will decide to get married at Christmas. Carlin will get engaged near the time that Tori gets married. Carlin will get married in the spring. Josie will get engaged around the time that Carlin gets married. Josie will get married next fall. I think Tori might already be engaged, especially since the blog said that Bobby asked Gil an important question. My guess is Tori and Bobby will get married in February while she delays her last term. Carlin and Evan will get married in July 2018 and Josie in Oct 2018. Lawson will get married in May 2018...4 weddings in one year! Carlin and Evan/Josie and Kelton - how special would it be to see a double wedding late next spring, early next summer!! If and when these couples decide to get married is up to them. Why put pressure on these young people? They are young. Give them time and space. I don't think anybody is putting pressure on them. They are just having fun guessing! I really think that Tori and Bobby will get married before she graduates, like maybe at Thanksgiving or Christmas! These girls all seem so young to be so serious but, they are matched well with what appears to be some very special God fearing young men. I wish them all the best. I really hope Tori finishes school first. If i we're to make a few guesses I think Tori will get married during the semester break which could be shortly after Christmas. I think Carlin will begin a courtship in September and married in the Spring of 2018. And lastly I ghinkJosie may start a courtship by Christmas, engagement byMay and marriage in the Fall of 2018. God bless them all. How old is Josie? She needs to slow down! Josie is young and it won't hurt her to wait awhile. I am not sure how old she is..18 or 17? She just turned 18. That's not too young for these people though. Alyssa got married when she was 19, and so did Joy-Anna Duggar (who is now 19 and pregnant). When you grow up in this community, young marriage/pregnancy isn't a strange thing. It's the goal for them because the younger you get married, the more babies you can have. I still think 18 is still too young for marriage. Mom and dad should insist the girls finish their schooling before they marry! They have a right to their chosen education- so young, don't rush. Marriage lasts a lifetime. They have the right to get married if they want. No one is twisting their arm. Just because they get married doesn't mean they can't go to school and pursue a career. I don't think it's a matter of "right". Every 18 year old has the right to do whatever they want to do, concerning marriage. That doesn't mean, though, that there are better and worse choices. It doesn't mean that just because you can it's a good idea to get married as soon as possible. Do some growing first! It's possible and it's a beautiful thing to be young and relatively worryless until your mid-twenties, like Michael did. You can start to work, figure out what you want to do in life.... All while being in a relationship with a good partner who respects you and wants to grow with you. They are doing what they desire for life, anon@4:40. If they and their parents are all green lights with these marriages, then it's alright. Ok the only reason Michaela waited is because her husband Brandon was in school in Chicago at the time and I agree Josie should wait but that is not up to anyone but her and Kelton and Tori got married December 16th and Carlin entered into a courtship about 2 months before Tori got engaged. Tori in May. Carlin in July. Josie March 2018. Look at Kelly Jo looking cute in her running skirt!! Go Kelly Jo! so excited for all of them!! You can purchase the episodes on iTunes and Amazon.